The Bureau of Public Health oversees the application of the National Shellfish Sanitation Program (NSSP) within the State of Maine. This program is implemented internationally by the Interstate Shellfish Sanitation Conference (ISSC) in order to keep molluscan shellfish safe for human consumption. This is accomplished by making sure that a common set of standards are used to classify shellfish growing areas and handle shellfish when they go to market. Shellfish Management - assists towns in managing their flats and shellfish. Area biologists help towns with their conservation areas, reseeding, surveying, town license allocations, shellfish ordinances, warden programs, and more. Environmental Permit Review - conducts/coordinates environmental impact reviews for permits and projects in the coastal zone, involving regulated activities such as wetland alteration, pollution discharge and dredging/dredge material disposal. 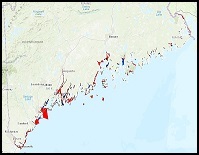 The program is also responsible for reviewing projects seeking leases on publicly owned submerged and/or inter-tidal lands, which could have an effect on Maine's fisheries infrastructure, as well as reviewing and commenting on municipal comprehensive plans which may affect marine, estuarine and riverine resources. Some of the links are PDF files, and may require the free Adobe Reader software (download here). If you require an alternate format, please contact Kohl Kanwit.